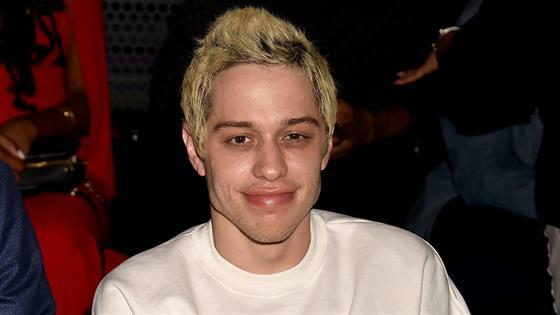 Pete Davidson and Kate Beckinsale are keeping things casual. The pair of A-listers made headlines on Friday night, when they were spotted leaving the Los Angeles comedy venue Largo at the Coronet together, after the Saturday Night Live star finished his show. Pete proudly held the Brit's hand and ate a lollipop, while Kate followed his lead to the car in a chic black and white checked AllSaints coat. Their PDA all but confirmed that a romance is brewing between the comedian and actress, but a source tell E! News that they are keeping things "casual" for now. "They spend most of their time on opposite coasts so it's a casual thing," the source explains. "But they are going to keep talking and having fun together." Moreover, the Underworld star seems totally smitten with the 25-year-old. The insider says, "Kate thinks he's the sweetest and nicest guy." "They may seem like an unlikely match but she thinks he's great and she just loves all the laughs she has with him," the insider adds. Sparks first ignited between the pair a few weeks ago at Netflix's 2019 Golden Globes after-party. A source told E! News that Davidson and Beckinsale were spotted looking "very cozy" on the smoking patio for about an hour. "She was very flirty with him and there were definitely some vibes going on," the source shared. "Pete was smiling and laughing with her and she was all about him." News of Pete's romance with the 45-year-old comes after the comedian split from fiancé Ariana Grande. The two were engaged for a short time, but shockingly called off their engagement in October. As for Kate, she clearly has a thing for funny guys. She was recently spotted making out with comedian Jack Whitehall and dated comedian Matt Rife before that. A source previously told E! News, "Kate likes dating younger guys and having fun with it. She's very youthful and young at heart so it works for her. It's easy and less pressure dating someone young who isn't looking for a serious commitment."